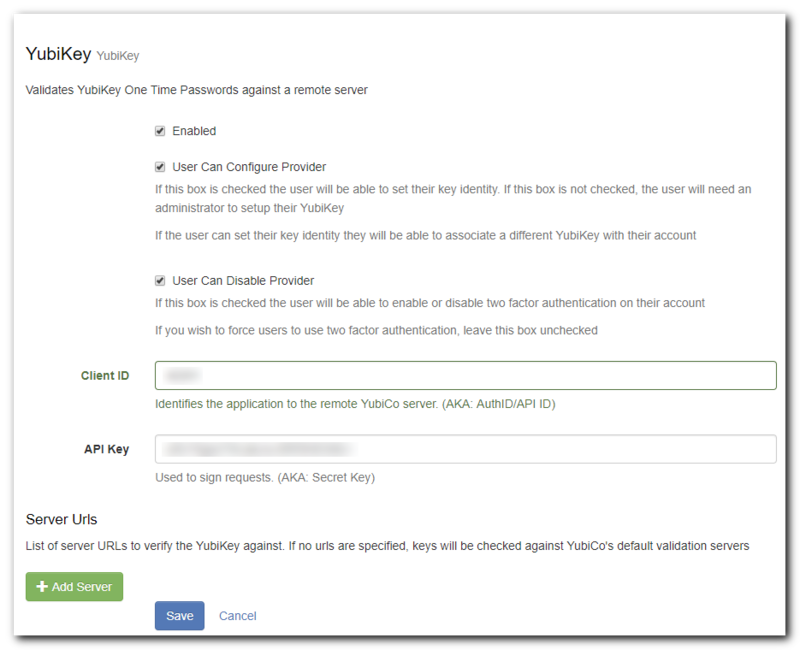 This is a quick guide to setting up YubiKey Authenticator with Pleasant Password Server. For background information on YubiKey Authentication Services: start here. install any YubiKey software that came with the device. wrong slot will cause errors. Navigate to "Users & Roles > Manage Policies". Create a new policy and set the applicable fields and flags. accounts have been individually configured to use at least one 2FA provider (eg. YubiKey). instructions to the end to avoid locking out users. If you're already locked out, please Contact us! You'll be returned to the "Manage Policies" page, where you'll see the policy you just created. Click the name of the policy you just created, or that of another policy you want to change. Other checkbox settings are optional: read the explanations for details. Navigate to the Yubico website to obtain a Client ID and API Key. a one time password (get one by using your YubiKey device). Enter your Client ID and API Key. (Optional) If you are running your own YubiKey Authentication Server, click + Add Server and enter its URL. Navigate to "Users & Roles -> Manage Users" and click Edit in an existing user's "Actions" dropdown. Set the "Policy" field appropriately, then click Save. You'll be taken to the user's "Details" page. In the "Policy Information" section you'll see a "Two Factor Authentication" table; click [Configure] in the YubiKey row. Success: If the Key is accepted it will auto-save and close this window, and return you to the previous screen. Failure: If the Key was not accepted it will show a notification of a "Failed to verify... Please try again"
Try to log in as the user you configured 2FA for. Select the text box and press the button on your YubiKey; you'll see text appear.